Tamarisk School, distinguished by its attractive bell tower and round-arched entrance, is the best preserved of the few surviving examples of Plan No. 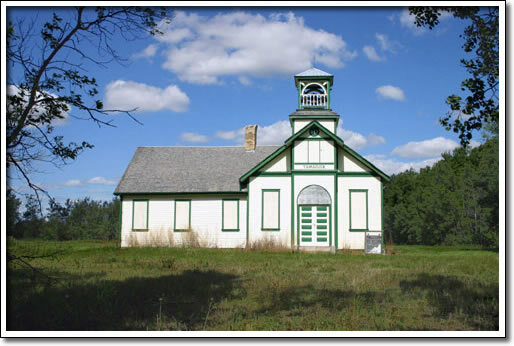 2, one of the earliest standardized provincial plans for multi-grade rural schools in Manitoba. This first group of plans, prepared for the Department of Education by Winnipeg architect Samuel Hooper, incorporated up-to-date features for student comfort and health, but also recognized the need to provide fledgling school districts with economical design options. Situated along the historic Russell Trail, an important pioneer route, Tamarisk School was the heart of a vibrant and populous area also served by a neighbouring community hall and nearby Methodist church. Such was the area's growth that a west wing was added to the school in 1919, allowing for a separate high school room, not often found in rural educational facilities. The school site retains its original open quality even with the loss of other structures that would have served the facility.